A 2009 research brief produced for the NTAR Leadership Center, a consortium led by the John H. Heldrich Center for Workforce Development at Rutgers, The State University of New Jersey. Founded in 2007 under a grant/contract with the Office of Disability Employment Policy at the U.S. Department of Labor, the NTAR Leadership Center's mission is to build capacity and leadership at the federal, state, and local levels to enable change across workforce development and disability-specific systems that will increase employment and economic self-sufficiency for adults with disabilities. 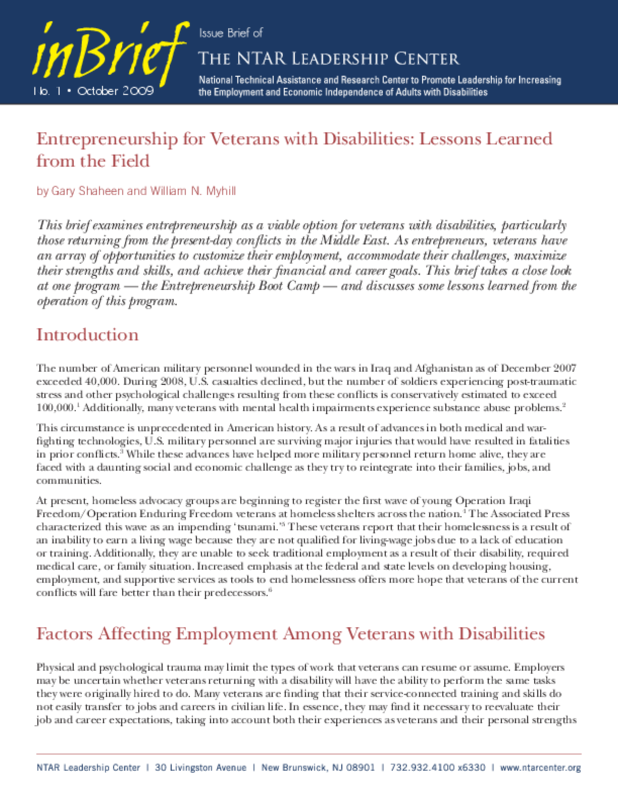 This brief examines entrepreneurship as a viable option for veterans with disabilities, particularly those returning from the present-day conflicts in the Middle East. As entrepreneurs, veterans have an array of opportunities to customize their employment, accommodate their challenges, maximize their strengths and skills, and achieve their financial and career goals. This brief takes a close look at one program -- the Entrepreneurship Boot Camp -- and discusses some lessons learned from the operation of this program.